Professional Cleaning Services For Day Care - Maintaining A Safe Environment For Kids - American Cleaning Services. Inc.
Daycare cleaning isn’t easy and it can be very confusing as well when you’re not using professional cleaning services. After all, you need to clean, sanitize, and disinfect. There are so many different things and places to clean that it might be hard for you to do it on your own. 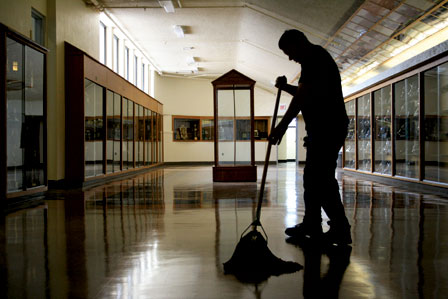 That’s why you need the best janitorial services New Jersey. When you do daycare cleaning, it needs to be a thorough activity. After all, you will see the paint and marker messes not to mention all the potty accidents and food spills. The place simply needs to be completely spotless and safe for children to play. The right day care cleaning is crucial. This is how you can make sure that children remain healthy as well as you decrease the risk of an infection by viruses, bacteria, mold, and fungi. Most day care cleaning services tend to use bleach solutions. However, these solutions have some drawbacks, especially for more sensitive children. And this is why a day care cleaning shouldn’t be done by someone who has no experience. You really need to hire professional cleaning services that will make sure that not only the day care will be cleaned as the cleaning products won’t affect the children in no way. #1: Light switches, entry ways door handles, floors, cubbies, keyboards, walls, phones, pens, and railings. #2: Diaper changing surface: despite the surface needs to be cleaned between a diaper change, the location needs to be spotless. And this includes cleaning up everything the child touched. #3: Play areas: these include wipe play surfaces, play centers, and shelves. #4: Toys: it’s crucial to have them clean throughout. Every child handles them and they can easily pass the germs from one to the other. The toys can either go into the dishwasher when they’re made out of plastic or they can go into the washing machine in the case of bedding, linens, and washcloth toys. #5: Bathrooms: All the toilets, rugs, sinks, floors, and light switches need to be cleaned. #6: Kitchen: These include cleaning up counters, trash cans, floors, faucet, stools, high chairs, tables and chairs, and bibs. #7: Other spots: there are often some missed spots that most people tend to forget about. However, our professionals don’t. These include drinking fountains, shared keyboards, shared tables and chairs, doorknobs, telephones, light switches, faucet handles, railings, toilet levers, and nap mats. As you can see, there are many areas around the day care facility that need professional cleaning services. The health of our children depends on them.